Hannah doesn’t have much luck, the year she arrives in London the plague hits, then the next year she returns and there’s a great fire blazing, but my oh my, Hannah’s story makes a great read. This is the second book in the Sign of the Sugared Plum series and it’s just as good as the first. Hannah’s character has developed and she’s no longer the younger one but the more responsible older girl. Hannah really grows between the two books and I grew to love Hannah even more. She has lived through a lot but is still there fighting right through to the end. A large part of this story does actually happen outside of London, when Hannah and Sarah find themselves at Lady Jane’s. I got bored of this part of the story in all honesty, it was good but I much preferred it once Hannah and Anne got in to London. It was good to know what happened after the first book but there was more action and passion in the latter two thirds of the book. Petals in the Ashes followed the lead of its predecessor by having wonderful character. Mr Newbury was again in residence and Anne was an interesting character. She was a mirror of what Hannah was in the first book and I loved that Hannah’s role was reversed. Hannah’s romantic interests became even more prominent in this book and I feared for Tom on more than one occasion, especially when Bill came into the picture. I didn’t like Bill and thought he was a bit selfish but I guess it’s probably because he put Tom’s position as Hannah’s sweetheart in jeopardy! I loved this story and it felt exciting yet also slightly terrifying to see the Great Fire of London from the eyes of someone living it. It truly felt like a memoir of sorts rather than fiction and I admire the way Mary Hooper has a knack of making me want to find out more about historic periods that I haven’t even really thought about before! I honestly thing this series would push any young teen into wanting to find out more about the events of the past and the people who lived them. Mary Hooper is a teacher of the kind that every teen should have! 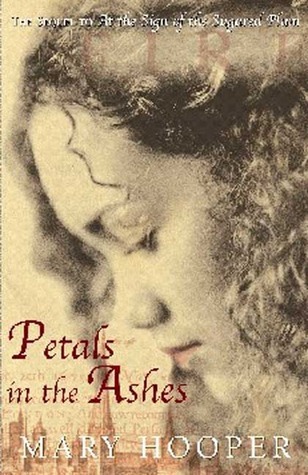 Petals in the Ashes is the second in the Sign of the Sugared Plum series. It was first published in 2004 by Bloomsbury Children’s Book’s. My copy of the book was received in the Fever and Flame omnibus format from the publisher. October 7th: the day I met Jennifer Donnelly!